It’s 1853 and enterprising American Hiram Hutchinson is hanging out in France when he decides that farm workers need to wear something better than clogs. 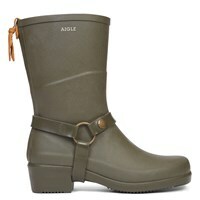 Enter ‘A l’Aigle’ or “to the eagle”, a nod to his Yankee roots and a brand new line of rubber boots. Essentially, the Hunter of France, Aigle continues to create stellar quality products because they’re still being handmade.